With that as an inspiration, I did some internet research and found a set at the local Lowes with a texture I liked. 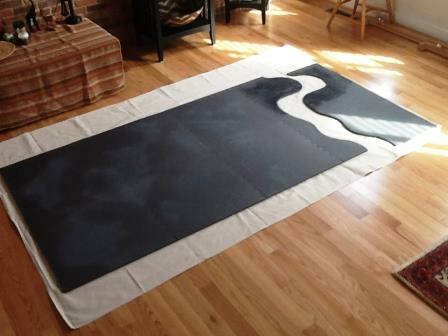 With two packs, six of the eight tiles makes a 4′ 2″ x 6′ 2″ game board. I used the remaining two pieces for a coastline by trimming it up a bit. I kept the piece left over to use as an opposite riverbank. 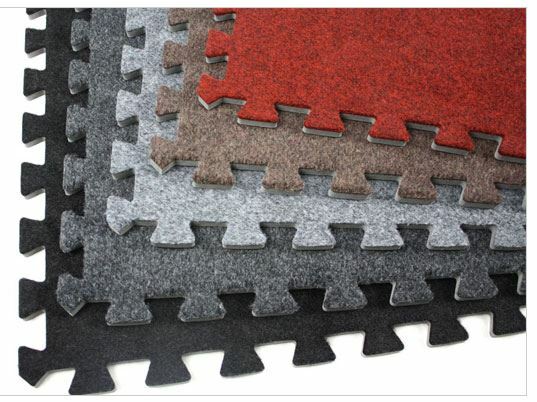 In the future I might also get a pack of the interlocking carpet tile such as this. The light gray may be brighter in low light and may not show the interlock pattern. 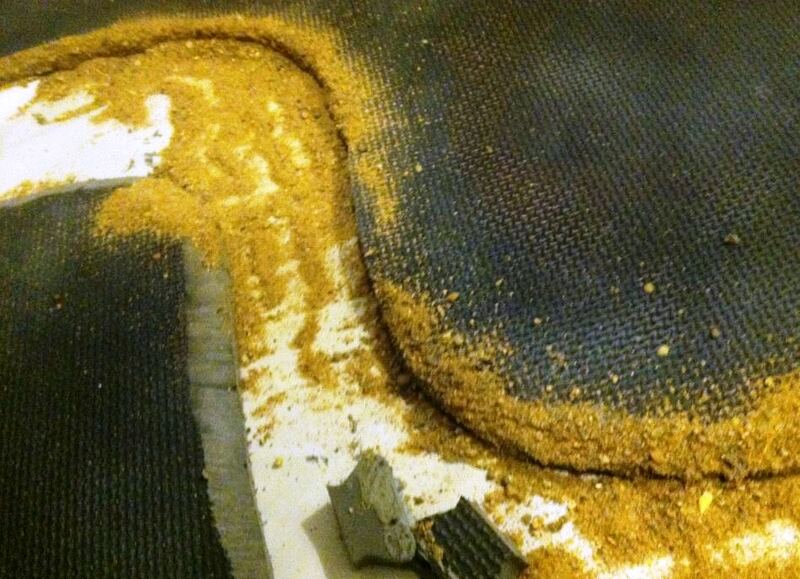 One 2×2 carpet tile is about $8 so it would be more expensive at about $64 vs about $40 for the foam. The foam can also be found cheaper on line, but with shipping it’s probably a wash and the Lowes is close by. I’m pretty sure this is all I’ll need, but TheGM has plans to get a pack and add some town terrain. 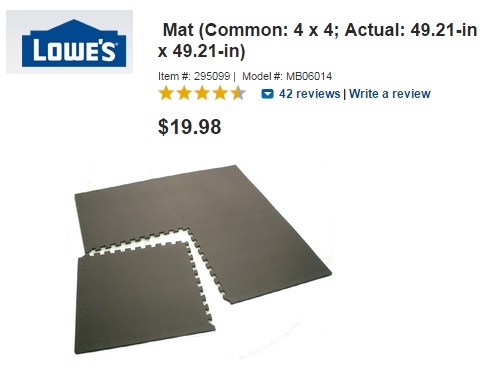 Two packs make a 4 x 8 mat. 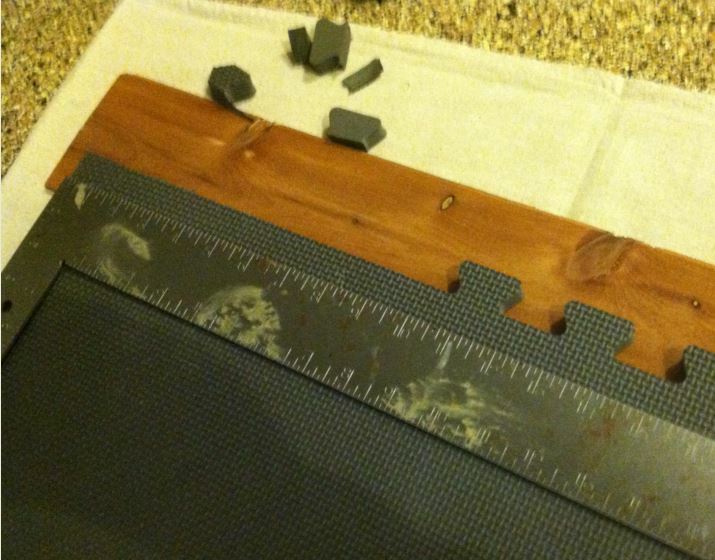 I’ve put a 4 x 8 section together and trimmed the nubs to take off 2″ from one side. This will take out some of the interlocking lines that are a little distracting and leaves me with a 4′ width. The pattern suggests texture without having to flock the mat. 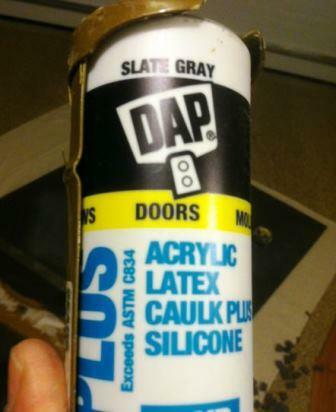 The DAP with silicone seems to bond well to the foam material and remains flexible, unlike carpenter’s glue. I’ve put it on the edge of the coast / river line and pressed sand into it. This section can also be a sunken road, draw or even a trench line. 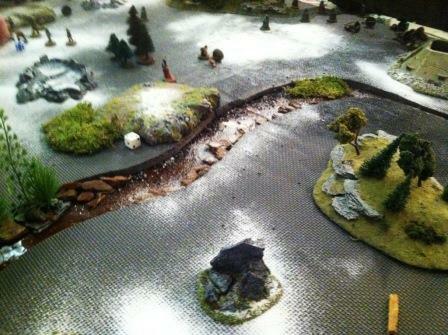 With white flock poured liberally in places this made very nice winter terrain. At the end of the game we just swept up the flock with a paint brush to reuse later. TheGM and I will be building up the board with additional pieces as we get ready for Historicon 2015. Check out the Martian terrain and the hedges we did earlier. I’ll be making some area terrain pieces next.